It’s true: you cannot always trust your brain. The reason lies in the way our brains use mental shortcuts to process information quickly. As we become more inundated with information, the tendency to rely on these mental shortcuts increases. Unfortunately, this processing “efficiency” can cause smart people to come to incorrect conclusions. In turn, these errors in thinking can compromise decision making ranging from strategic planning to mergers and acquisitions to talent recruitment. At the top management level the costs of flawed decisions can easily run into millions of dollars. Let’s examine three common cognitive biases that create decision risk, along with ways to neutralize their impact in the office and boardroom. 1. Confirmation Bias involves the tendency to seek out information that supports our preferences or point-of-view and ignore or discount information that contradicts them. This bias can be identified by behaviors including selective attention to the facts, abbreviated fact-finding, excessively edited or filtered analyses, and exclusion of contrarian points of view from key meetings. Example: A board of directors that is keen to acquire a competitor company focuses on projections of increased market share while downplaying concerns about integrating two very different corporate cultures. The deal goes through but fails to deliver results due to the flight of star talent. Neutralizer: Confirmation bias can be difficult to counter, especially when it occurs in the corner office or boardroom, since it requires “telling truth to power.” The best way leaders can guard against this decision risk is to adhere rigorously to an evidence-based process of inquiry, analysis and discussion that encourages diverse opinions and disconfirming data. 2. Attribution Bias involves the tendency to interpret positive outcomes as the result of our own efforts while blaming undesirable outcomes on others or situational variables. In other words, we claim successes to be the results of our own brilliance and efforts, but distance ourselves from failures by pointing the finger elsewhere. The risk with attribution bias is that we misconstrue cause-and-effect. This fundamental error can lead to a path of decisions and actions that have little or no basis in fact, and therefore limited chance of successful replication over time. Example: A sales executive takes the credit for landing a big manufacturing account as a result of his innovative pricing model. In reality, the client signed on because of singular geographical and transportation advantages his firm’s location offered over competitor bids. Consequently, what the executive considers a winning sales weapon instead proves to be a one-off victory. And furthermore he blames subsequent failures on “industry slump” rather than his ineffective pricing model. Neutralizer: To neutralize attribution bias it is important to test assumptions and cause-and-effect before drawing conclusions. Egos need to be sufficiently in check that wins and misses are both studied comprehensively for lessons learned. In this way leaders can distinguish between strategies and tactics that are repeatable as opposed to those that worked due to unique factors or sheer luck. 3. Recency Bias involves the tendency to weigh recent experiences more than earlier ones. This is because our brains recall what happened lately more vividly than similar events that occurred farther back in time. Recency bias often operates subtly or outside conscious awareness. The risk with recency bias is that we make decisions that are unduly influenced by vividness of recall. Our minds can (mis)construe this vividness as “better” or “best” when it comes to selecting from a list of choices. Or the opposite may occur with a recent negative experience being appraised as worse now than it is once time passes. 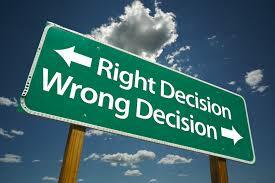 Example: Hiring decisions are common situations where recency bias occurs. This can be the case whether the selection process occurs over weeks or a short list of candidates is interviewed over the course of one or several days. In either instance, the last candidate stands a good chance of being more memorable –either positively or negatively – than those who came before. Neutralizer: Decision makers can counter the effects of recency bias by making a point of revisiting earlier options, especially if much time has passed. Another tactic involves developing a decision template with specific criteria and priorities – and sticking to it. These three cognitive biases can influence our thinking and judgment on a daily basis. When it comes to high-stakes decisions, we need to recognize our risk factors and have an effective repertoire of neutralizing tactics to insure our thinking is as error-free as possible. Brilliant execution requires it!